Boasting a brilliant color 5” LCD touchscreen in a sleek and modern design, the Partner LUX 2® features a new, innovative, and robust hardware platform with a powerful CPU, utilizing the latest Android OS. 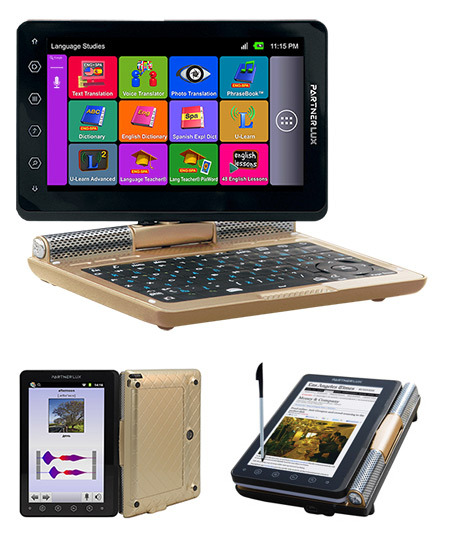 The clear and 180-degree rotating screen allows for extreme flexibility of use, giving the user an instant conversion from a keyboard-based device to a slim tablet. Boost your Partner LUX 2® to PRO by adding the Ectaco C-Pen Scanner to scan any printed text and translate it instantly within the Partner LUX 2®. Use the NEW Hi-Resolution camera with our Photo Translator program to snap a picture and translate any text instantly. For those looking to view pictures, movies, play music, or even learn a Language from the LUX on their TV, a micro-HDMI port has been added for easy connection to your TV and other devices. The LUX2 is the ultimate Language Learning and Translation tool ever created. Preloaded with the new Language Teacher and U-Learn 2.0, users can learn with these in depth teaching programs, designed for users at any experience level. Comprehensive lessons, voice training, and hands-free and eye-free teaching games make learning a new Language fun, simple, and easy. The “Word of the Day” application will guarantee you learning a new word every day. For more information, please visit http://www.ectaco.com/info/LUX-series/ or contact Rob Arvelo at 718-728-6110 ext.212 or rob(at)ectaco(dot)com. Ectaco Partner LUX 2Portable voice and picture translator with comprehensive language tutor program.